The Nuclear Reactor Plant in Three Mile Island in Dauphin County, Pennsylvania sits on the Susquehanna River close to the town of Harrisburg, Pennsylvania. This civilian run nuclear power plant features two individual nuclear reactors which are generally referred to as TMI-1 and TMI-2. The Three Mile Island nuclear generating station was built by the General Public Utilities Corporation with construction beginning in 1968 and continuing through 1970. The station itself was commissioned in the beginning of September in 1974 and it continues to operate with a license that is valid through April of 2034. The two units of the nuclear plant itself were designed by two different architects with unit one being designed by Gilbert Associates and unit two being designed by Burns and Roe. The two reactors of the plant were supplied by Babcock and Wilcox and are PWR reactors, meaning that they are pressurized water reactors. What Are Pressurized Water Reactors? Pressurized water reactors are the type of nuclear reactors that are most frequently utilized in the western world nuclear power plants. Pressurized water reactors are a variety of light water reactor rather than a boiling water reactor. This variety of water reactor features water that is sent to the core of the nuclear reactor through a high pressure pump. Once the water hits the core of the reactor it heats from the energy that results from atom fission. Once heated the water passes through a steam generator where its thermal energy creates steam, through the use of turbines this steam controls an electric generator. In the light water reactors rather than the boiling water reactors there is a certain amount of pressure that is maintained in the coolant loop that stops water from boiling inside the reactor, in the light water reactor the water is a coolant as well as a moderator of neutrons. The water within the light water reactor is referred to as a neutron moderator since it slows down speeding neutrons and makes them thermal neutrons. Thermal neutrons are what sustain the nuclear chain reaction when uranium is involved in the nuclear process. Having extensive knowledge of the functions of a nuclear reactor is not necessary in order to understand the Three Mile Island disaster; however, but a little more background information on what led up to the disaster of the nuclear plant is. The Three Mile Island nuclear reactor was owned and operated by General Public Utilities and Metropolitan Edison at the time of the accident which began on March 28, 1979. It was around 4am when failures in the secondary system began to signal that something was wrong; however the events that led up to the core meltdown can be attributed to a chain of reactions that began the night before. As mentioned previously, the nuclear reactor on Three Mile Island functioned with two units; however, the night before the core meltdown the first reactor, also referred to as TMI-1 was shut down so that it could be refueled. While TMI-1 was shut down, TMI-2 was functioning at 97% but by 4am things began to go awry in the second reactor. The malfunction is believed to have begun in the secondary loop of the reactor, one of the three areas of the reactor that is charged with delivering water/steam to the reactor. Within the secondary loop of the reactor there are filters that are referred to as condensate polishers, and at this time workers at the plant were attempting to remove a blockage from one of the multiple polishers. Unfortunately as the workers attempted to remove the blockage, the pumps that lead the water and steam to all eight of the polishers stopped working. Researchers are still unsure as to why the pumps stopped working, but they do know what happened next. As the pumps leading to the condensate polishers stopped working other parts of the reactor failed as a result. When a bypass valve did not open as a result of the failed condensate polishers, water stopped moving through to the pumps within the reactor and as a result these two shut down. Nuclear reactors have a built in failsafe method which enables them to shut down when features of the reactor fail to work normally and when the steam generators within TMI-2 stopped receiving water the reactor shut itself down based on the emergency shutdown protocol. While the reactor had been shut down and workers had inserted control rods in to the nuclear core of the reactor in order to stop the nuclear chain reaction within, the reactor was no longer being cooled. Since TMI-2 depended upon a water based cooling system, without a steady supply of water the reactor was no longer being cooled and even though the nuclear chain reaction had been halted, workers were unable to prevent the heat from decay of the core because there was a no longer a cooling system in place. Nuclear terminology can become slightly confusing when you are unfamiliar with the workings of a nuclear reactor. When the term “decay heat” is mentioned in reference to the heat that is released by a nuclear reactor even when the reactor has been shut down via emergency protocol, it refers to the process of radioactive decay. Despite the fact that the nuclear reactor had been shut down heat was still being released by the decay of radioactive materials. As radiation interacts with other materials radioactive energy turns in to decay heat as a result of the thermal movement of the atoms within the material. In the normal reactor process energy that is produced from fission is deposited in to the core of the nuclear reactor; however, when the nuclear reactor has been shut down via emergency protocol the core power of the reactor will decline; however, energy is still being produced as the fission remnants decay within the reactor’s core. 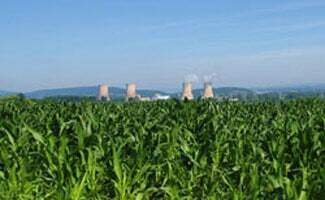 The longer that a nuclear plant is shut down the less decay heat will be produced by the plant. In a fully functioning nuclear reactor the decay heat is able to be removed from the reactor and the core temperature of the reactor is brought down to a manageable level. In TMI-2 where the cooling system had failed the decay heat is unable to be removed from the reactor core and the temperature continues to rise to dangerous levels. As the pumps stopped feeding water through to the reactor core additional pumps kicked on automatically in an attempt to prevent nuclear meltdown, unfortunately, the valves that allowed these pumps to function had been closed as the reactor was undergoing maintenance. Since the backup pumps were unable to circulate water through, the system pressure began to build up within the reactor and the pressure relief valve was activated in order to relieve some of the pressure within the reactor. While the pressure relief valve opened and relieved some of the pressure within the reactor, it did not automatically close again as it was supposed to do and as a result of this mechanical failure what coolant water there was within the reactor escaped and disaster was set in motion. After the valve failed and coolant was permitted to escape from the reactor a signal light in the control room of the reactor shut off to indicate that there was no longer power being supplied to the pilot valve and as a result it was malfunctioning. Due to improper training of employees of the Three Mile Island nuclear plant; however, employees within the control room took the unlit light to mean that the valve had been shut. It is this degree of human error that led the disaster at Three Mile Island to get so far out of control since the warning light” did not provide any clues as to whether the valve was open or closed; only that it was no longer receiving power. Since workers could not tell whether the emergency pressure relief valve was open or closed at the time of the incident they were unable to discover what was causing the reactor to overheat so quickly for hours. Were the workers able to distinguish that the relief valve had stuck open upon first glance at the warning light, the relief valve problem could have been addressed and a degree of coolant may have been able to have been saved. As the pressure relief valve stayed open pressure was being released from the reactor; however, coolant continued to escape as well. The reactor soon hit the point of nucleate boiling – when steam bubbles formed within the reactor but collapsed quickly and soon pockets of steam began to develop within the coolant of the reactor. As these steam pockets formed they began to prevent the remaining coolant from flowing in the reactor and the temperature within the reactor continued to rise. Within the nuclear core employees were able to measure the level of coolant in the core by observing the pressurizer level; however, as the steam pockets formed they created gaps within the coolant which misled employees to believe that the level of coolant within the reactor was where it should be. The level of the pressurizer led employees to believe that there was no longer use for the backup coolant system and they turned off the emergency cooling pumps out of concern that the core would be over filled with coolant. It was this misunderstanding that allowed the core of the reactor to continue to overheat. 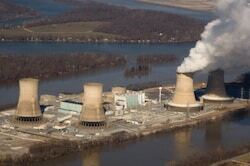 It was not until 4:11am that alarms began to sound at the Three Mile Island nuclear plant. This alarm sounded as a result of the quench tank overfilling – the quench tank is responsible for collecting the discharge from the pressure release valve; however, with the valve stuck open the quench tank in this situation quickly overfilled. It was this overfilling that finally sounded an alarm to notify employees that something was going awry at the plant. Upon analysis, employees discovered that the alarm was not the only signal of something being wrong at the plant; they also discovered that the temperatures of the discharge line that ran from the pressure release valve were unusually high. While these signals may seem like an obvious result of a coolant loss incident, for the employees at the Three Mile Island plant, these indications were ignored. Just three minutes following the sound of the quench tank alarm the diaphragm of the quench tank ruptured and coolant that had been released from the reactor began to leak in to the general containment building – the reinforced structure that encapsulates the nuclear reactor itself. This overflow of radioactive coolant was them pumped out of the containment building in to an auxiliary building, relieving pressure on the general building until the pumps that were pumping the radioactive coolant in to the general building were stopped. These pumps would not be stopped until 4:39am, 28 minutes after the initial sounding of the alarm. As the temperatures within the nuclear reactor continued to rise, the pumps that at one time circulated water now began to form large cavities within them as steam bubbles formed within the water. The pumps that now contained this steam and water mixture were shut down and while it was believed that the water within the system would circulate naturally, the steam pressure continues to build. Two hours and ten minutes after the Three Mile Island reactor began to malfunction, the top of the reactor core was visible and the steam within the reactor began to react with the nuclear fuel rod covering. As the steam reacted with the covering of the nuclear fuel rods it produced even more heat as well as hydrogen and zirconium dioxide which burned off the covering of the nuclear fuel rods and damaged the fuel pellets which allowed for even more radioactive material to escape in to the coolant that remained within the reactor. This chain of chemical reactions later led to a hydrogen explosion in the containment building of the nuclear reactor later that day. It was not until 6am that a new shift of employees would come to work at the reactor and realize that the temperature of the pressure relief valve was far too high and it was then that they implemented a backup valve to stop the coolant from venting. Unfortunately by the time that these new employees realized what was causing the temperatures of the reactor to reach such high levels 32,000 gallons of the coolant had already escaped the reactor. Two hours and forty five minutes after the beginning of the situation the radioactive warning siren was sounded, by this time radiation levels in the coolant of the reactor had already reached 300 times what they were expected to be and the plant was considered to be in an emergency status. At 6:56 AM on the morning of the disaster the plant was declared a site of emergency and not long afterwards the risk for serious radiological consequences was announced to the public. While at the time many public statements were made by officials attesting to the fact that no radiation had been released in to the area, some researchers contested that belief stating that levels of radiation had already been measured outside the plant. As it stood; however, it was not believed that such short term exposure to these levels of radiation would result in any significant effects upon public health. It was at this time that state officials, believing that General Public Utilities and Metropolitan Edison were attempting to downplay the severity of the situation, called upon the Nuclear Regulatory Commission to investigate the situation. The NRE had as many difficulties as the state officials in obtaining the facts about the situation as it occurred and it would not be until years later that they would learn many of the true facts about the Three Mile Island Disaster. Seven hours following the beginning of the nuclear emergency new water was pumped in to the reactor and the backup relief valve was opened to relieve some of the pressure within the reactor. It took sixteen hours for the pumps to finally be turned on again at which point the core of the reactor began cooling down; however since such a considerable section of the core had already melted the threat of radioactive contamination was still present. As the reactor began to cool officials would be forced to implement a variety of techniques in order to reduce the pressure buildup within the reactor as well as eliminate the possibility of a hydrogen explosion as the result of a large hydrogen bubble which formed within the pressure vessel three days following the incident. One of the methods utilized to help to relieve the pressure formed from this hydrogen bubble was venting steam and hydrogen from the reactor in to the atmosphere – this was met with considerable concern on the part of the general public and state officials. While many people feared that nuclear material from the incident had been leaked out in to the atmosphere, researchers believe that due to the fact that such small amounts of the fission products that were released were solid at room temperature that the environment would suffer little contamination from radiological material. The EPA would discover no soil, water or plant contamination and an inter-agency analysis of data revealed no detrimental health effects from radioactive exposure within the population either. While this data seems satisfactory for many, however, there are still those who believe that the disaster at Three Mile Island led to radioactive contamination of the environment and the population surrounding the plant.